The alphabet I tested my patience. 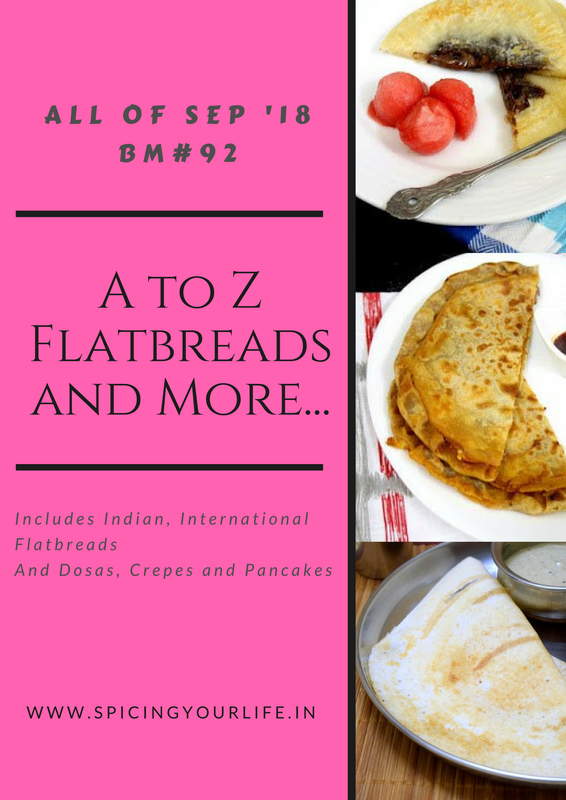 I searched for two or three days and couldn’t come up with a single flat bread across globe. The only bread which could fit was Injera which I blogged about earlier. So I had to use the country name in the heading. Noon Barbari or Naan Barbari is a pretty famous Iranian / Persian flatbread sold at bakeries everywhere in the country. These are either served with feta / jam / walnuts / sour cream / grapes / cucumber for breakfast. These are available fresh out of oven from 7 am at bakeries and you could find huge queues. They are made plain or topped with seeds like sesame, nigella or poppy seeds. The recipe is quite simple but the dough is so sticky and tough to handle. So don’t be tempted to add in more flour. It is sticky and you need to work with that. Kneading would be a problem. But you can repeatedly fold the dough onto itself to get that kneaded effect. The glaze used for these breads is called as the roomal and is made by boiling together flour, water and baking soda to a thick sauce consistency. The bread turns out very crisp crust and a chewy crumb, just like sourdough breads. And my daughter is a huge fan of such breads, so she enjoyed the noon barbari with jam for her lunch one Sunday. In a bowl, mix together flour, sugar, salt and instant yeast. Add water and make a sticky dough. It should stick to your finger when you try to pull it out of the dough. Do not add more flour. You need it to be sticky. Fold the dough onto itself. Repeat the process for 10 times. It will become less sticky. Apply some oil on top of the dough and set it aside for 1 hour or until double in volume. While the dough is resting, prepare the roomal or glaze. Mix together 1/4 cup water and flour and whisk until it dissolves completely. Bring it to heat. Add hot water and baking soda and cook until the glaze becomes thick enough to coat the back of the spoon. Line a baking tray with parchment paper and sprinkle flour on top. Dust your hands with flour and transfer the dough to the tray. Flatten the dough to form a rectangular disc. With the help of your finger or the side of your palm, make horizontal indentations on the dough. Brush the top of the dough with the roomal and sprinkle sesame seeds or nigella seeds. Bake in hot oven for 10 minutes or until the top is golden. Remove it and serve it hot out of oven. The bread looks so nice and crisp , I feel like having some . Twitch such soft dough it must have been a task preparing this bread , but I am loving it . It’s gorgeous . How soft and gorgeous those Noon E barbari looks, have tried long back and i totally fallen in love with this Iranian Naan. With our Indian style gravies, this naan will definitely please anyone’s tastebuds na. Would love to bake this Naan very soon, so tempting Gayathri. This looks so soft and perfectly baked. Loved the Noon E barbari and the glaze something unique. True the letters are now getting difficult , I am still shuffling my letters and recipes :-(. I totally understand how frustrating it is to find dishes for certain letters of the alphabet. So glad you picked this one….the naan looks fabulous and so soft and delicious! Yum!! Isn’t this bread just amazing…soft and yet crunchy. I loved baking it some time back, need to make it again. Yours has turned out so beautiful with a nice texture. I am totally in awe of this bread Gayatri, looks so simple but I know how difficult it would be to handle its sticky dough. I love baking with sticky dough as the texture of the bread turns out marvelous. I baked it some time back and loved using roomal in the recipe. I am sure Sruthi would have loved it. Gayathri, such a beautiful bread and I would love to have a bite. Though its sticky you have surely managed well and the bread has turned out good. I love crispy it looks. What a beautiful bread Gayathri! Love that sesame topping! This bread look like a garlic bread… so tasty and flaky.